As a "Top 3 Marriage Counselor" in Cary and North Carolina licensed marriage and family therapist, Dr. Hall is qualified to counsel individuals and families independently in private practice. Supervision is also available to MFT's in training because Dr. Hall is an AAMFT approved supervisor. Dr. Hall has worked with marriages and families in a variety of settings since 2003 when he saw his first family at the University of Southern Mississippi Counseling Center and interned at a substance abuse treatment center. After spending several year working in a community mental health center treating schizophrenia, major depression, and bipolar disorder, he left to start his doctorate at Brigham Young University and worked for several years at LDS Family Services counseling couples and families. Dr. Hall spent four years working on a Marine base in Twenty-nine Palms California helping military families, before settling in North Carolina and starting Hall Family Therapy and teaching at Pfeiffer University's Master's level MFT program for 3 years. .
With training in Eye Movement Desensitization and Reprocessing (EMDR) and Prolonged Exposure (PE), Dr. Hall is qualified and experienced in working with Post-traumatic Stress Disorder (PTSD). His clinical experience includes work in the Navy hospital Deployment Health Clinic in 29 Palms California, and a Family Advocacy Clinic on the Marine Corp base handling cases of domestic violence. Dr. Hall has has also completed Levels 1,2, & 3 Training in Gottman Method Couples Therapy and uses Gottman Method Couples Therapy in session. Check me out at Marriage Friendly Therapists.
" 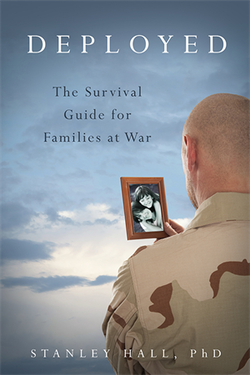 Just Between Us – Finally: Special Tools and Strategies for Military Couples "
To save the MP3 file to your computer, right click on "Download Episode" and select the option from the menu to save the file (save link as) on your system. Donate a copy to a military family or order your own copy!